Lulu's Life: The Cloud Junkies Review! 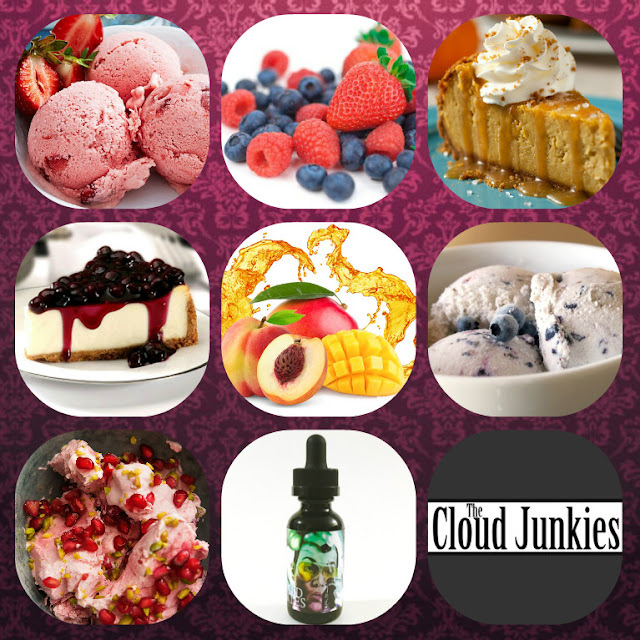 The Cloud Junkies sell their own brand of ejuice as well as a few other brands. They have 30ml bottles for $7.00usd and 120ml bottles for $15.00usd. The first time I ordered from the cloud junkies was a little over a year ago. From what I knew, the were a newer brand with good prices and not many reviews. So I gave them a shot and ordered a bottle of their juice Haze. I seriously fell in love on the first hit! I honestly had no idea what to expect. So far I have bought Haze, OHMS, King, Pang, R.W.S, Bury, Flip. They have many more flavors as well. I liked all of the ones I’ve tried, Pang and Bury were a bit harsh for me though. But then again I do have asthma and that makes it harder to take big hits. From my experience, they have always shipped my orders right away. Every bottle is packaged in bubble wrap and paper packaging. I have never had issues with bottles leaking or breaking. Packages always come within two to five business days of my purchase. 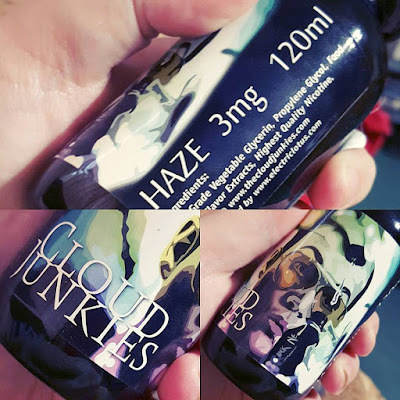 The Cloud Junkies became my favorite juice brand after my first order! Since then I have ordered from them regularly. If I am ever in a pinch and can’t order before I’m out, I’ll buy Vapor Lock by Cool Breeze Vapor. That flavor is similar to The Cloud Junkies flavor Haze. Haze has a smoother hit than Vapor Lock, but they’re both so good! Here’s some descriptions on the flavors I’ve purchased. OHMS is a strawberry ice cream flavor. To me, I taste a little graham cracker flavor in it. It almost tastes like Ben and Jerry’s Strawberry Cheesecake Ice Cream! Haze is a sweet blend of strawberries, raspberries and blueberries. They also state it has a hint of marshmallow to make the flavor smoother. I definitely agree with all of it. It’s my favorite flavor! King is a Pumpkin cheesecake flavor! It legitimately tastes like pumpkin cheesecake too. It’s like a Pumpkin spice latte in Vapor form. It’s the perfect fall flavor. R.W.S is a bomb blueberry cheesecake flavor. It tastes exactly like you would imagine! It’s sweet and tart at the same time. Another winner! Pang is a mango and peach juice with a marshmallow undertone. I think I’m going to start looking for that quality specifically. I love it so much. Bury is a sweet blueberry ice cream. Like R.W.S it has a delicious blueberry flavor. Compared to the cheesecake one, this one has more of the ice cream taste like you would expect. Flip is a delicious sharp flavor of pomegranate and raspberry ice cream. I think I have a thing for ice cream flavored vapes. It’s probable the slight vanilla hint in them. 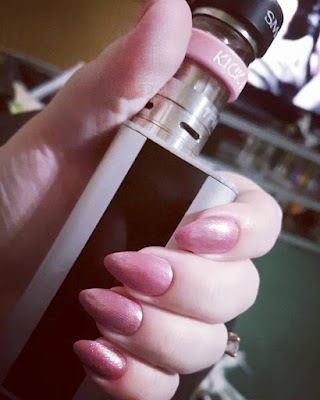 As you can see, there is a running theme in my vape “profile” if you will. I love fruity, berry flavors with marshmallows and vanilla hints. If you haven’t tried anything from them, this is the brand I highly recommend! My absolute favorite company. They often have sales and coupon codes. Always check their Instagram and Facebook for deals going on. If you sign up for email updates, they’ll email you whenever they are having sales. Thank you so much for taking the time out of your day to check out this review. If you have any questions comment down below or contact me, info on my contact page!